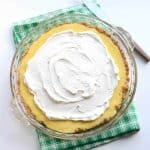 Rich and creamy North Carolina Lemon Pie with just the right amount of sweet and tart and made with an secret pie crust ingredient! Lemon lovers unite! 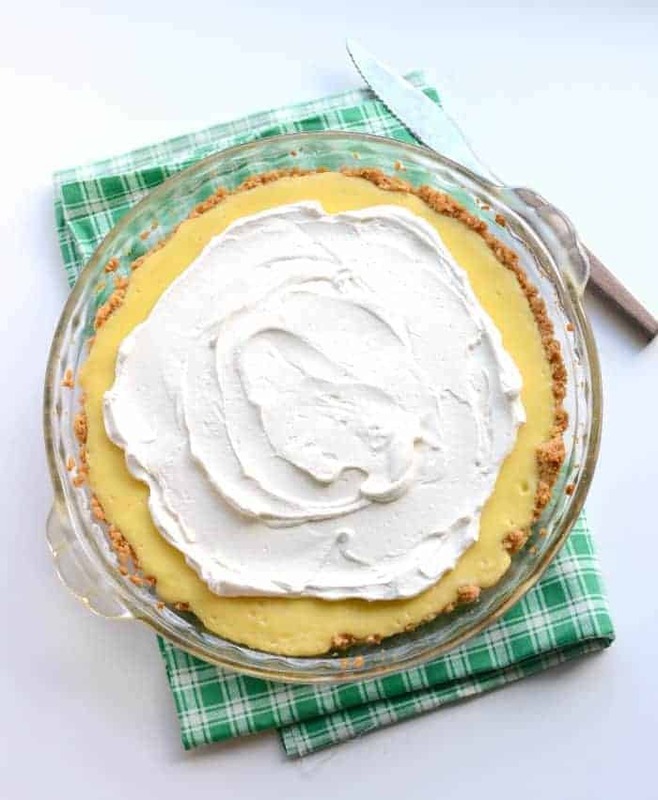 This simple North Carolina Lemon Pie is going to surprise and delight you, and I can’t wait for you to make it so that I can hear how much you enjoyed it! This recipe comes from the May 2015 issue of Cook’s Country magazine. It’s the magazine version of my favorite cookbooks (produced by America’s Test Kitchen!) and it is always fabulous. If you aren’t currently subscribing, I’d pick up a few copies from the library because they are not only full of great new recipes, but they have a tons of information, tips, and tricks. You get smarter and hungrier every time you read this magazine. 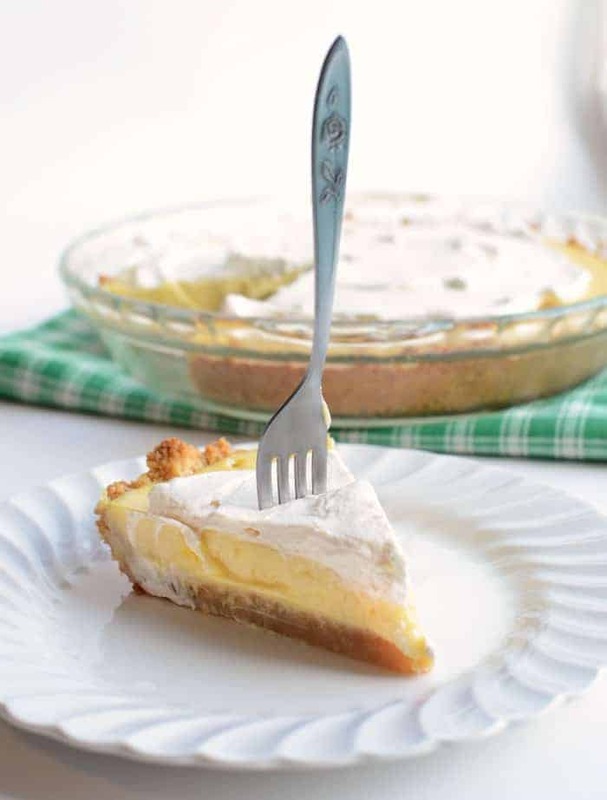 This North Caroline Lemon Pie is super simple to make. The crust is as easy to put together as a graham cracker crust, but here’s the secret, it’s made from Saltines! How neat is that? It’s crisp and delicious! The filling is just beat together and then baked (no stove top cooking first) and then it’s topped with a bit of whipped cream. Easy! It’s a sour, sweet, salty perfect pie combo that’s easy with no traditional crust to roll out. North Carolina Lemon Pie is my kind of dessert! Preheat your oven to 350 degrees. Add the saltines and salt to the food processor and pulse until you have coarse crumbs (about 15 pulses). Add the melted butter and corn syrup and pulse until the crumbs are about the size of oatmeal (another 15 pulses). To make the filling – whisk the sweetened condensed milk, egg yolks, cream, and lemon zest together in a bowl, add the lemon juice and whisk until well combined. With the pie plate on the baking sheet still, remove it from the oven and pour in the filling (the crust does not need to be cooled) and place it back in the hot oven. Bake until the edges of the pie are set but the center still giggles, 15 to 17 minutes. Place the pie on a wire rack and let it cool completely. Refrigerate the pie until completely chilled. For the topping, use a stand mixer fitted with a whisk and whipped the cream, sugar, and vanilla on medium low until foamy (about a minute). Increase the mixer speed to high and whip until stiff peaks form, 1 to 3 minutes. Spread the whipped cream over the top of the pie and serve cold. In the picture my bottom crust is a bit thick. I should have pressed more of it up the sides to make a taller crust… next time. Enjoy and have a great day! I have 16 pounds of strawberries to turn into freezer jam to use this coming year. Wish me luck. I have all of these ingredients in my kitchen right now! Hooray! You act as if a thick saltine crust is a problemmm…. My husband loves lemon pie so I tried this recipe–it was delicious!! It turned out excellently!! I was concerned that I had a regular 9″ glass pie plate (not with high sides) but it fit into it perfectly! Thank you! I enjoyed watching the cooks on Cooks Country doing this recipe on TV. I can’t wait to give this recipe a try. It looks absolutely delicious. I ha e not yet made this, but I will. But, do you know if anyone has tried to adapt this recipe into a lime pie by using lime zest and lime juice? I’m sure that it would work great! I’d love to hear if you try it! Looks delish! Can’t wait to try this!! Hi, question: if I bring this to a party, how long can it sit out without being refrigerated (i have a feeling they won’t have room with all the thanksgiving dishes). Thanks! Thank you for posting this recipe so I don’t have to have a subscription to ATK or Cooks Country! LOL, you’re welcome! And I’m glad your pie filling didn’t giggle. I actually have quite a few ATK recipes on here (I LOVE THEM) so take a look around! I made this before and the filing was plentiful, so this time I multiplied the crust by 1.5 because I love this crust. There was a little crust left over so I put it in the bottom of a cast iron Le Creuset dish and topped it with a thin layer of the filling for my own personal lemon bars, and it worked great. I wonder how whole wheat crackers would taste? Thank you for posting this recipe. It was easy to make but tastes like I spent a lot of time and effort. I took it to work and I was a star! Oooh I love how you said that! It’s so true, a gorgeous but fuss-free dessert! That sounds absolutely delicious. I LOVE grapefruit and never thought to put it in the pie. Thank you for the recommendation! I saw this on ATK too. I’m glad I made this pie, it was really good. However, I am glad I weighed the crackers as one sleeve was only 4.4oz. 6 oz. was just under 1 1/2 sleeves. So cooks out there, weigh them to be accurate. Super easy and sooooo yummy! I made this for the first time and my husband and I just love it. Refreshing, mouth-watering combination of tart, sweet, and salty. I used about 1.5 sleeves of Premium Whole Wheat Saltines. Turned out great. It’s a keeper isn’t it!? So glad you loved it! boy, am I glad I live next door. I am a lemon lover and lament the fact that I do not often find a good lemon pie, let alone one with a fantastic crust! Well, here I am leaving a comment, then printing the recipe so that I can make a whole pie for my home. Unfortunately, my neighbor only let me opinionate on one slice…. This was such a fun comment. Thank you for being here and tell your neighbor for being kind enough to share the pie (and my recipe) with you!